1	Line a muffin tin with 10 muffin cases. 2	Place the chocolate, syrup, cacao powder and butter in a bowl over a saucepan of simmering water and allow to melt. 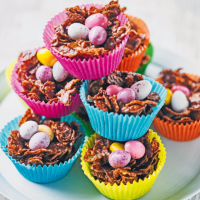 Mix into the cornflakes until evenly coated. Spoon into the muffin cases and make an indent in the centre. Place 3 mini eggs into each nest and chill until firm. Best eaten at room temperature on the day it is made. Alternatively, keep chilled then return to room temperature before serving.